Passion for food while maintaining compassion for all living things. I was invited a cereal themed birthday party recently and felt that I should do something fun with breakfast cereal. I had a feeling rice krispie treats would make an appearance regardless, so I thought of one of my favorite breakfast cereals, Grape Nuts, and the rest just followed suit. Breakfast & dessert together at last. I thought that Grape Nuts would make a nice pie crust, except that they are SO crunchy and are sort of intense to eat. I put them in the food processor, hoping that my blade wouldn’t dull from the hard labor. It took awhile, but it got to more of a graham crumb consistency (but still retained it’s crunch). I mixed the crumbs with melted Earth Balance and pumpkin seed milk until I could squeeze it into a ball. I added some shredded, unsweetened coconut to the crust as well. 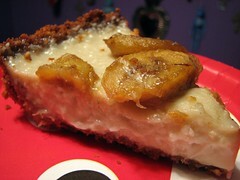 For the filling, I used the Lost Coconut Pie from Veganomicon and topped it with caramelized bananas. If I made it again, I would use 1/2 the amount of coconut in the filling and use fried plantains on top. Regardless of my perfectionism, it was decadent, creamy, and a hit at the party. I’d eat this for breakfast! What a creative idea! You’re right–Rice Krispies are too obvious a choice. Thanks Destiny! I’m really happy with how it came out. My runner-up idea was something with Kix and peanut butter.